Friends and family members always appreciate Christmas cards but photo Christmas cards are enjoyed even more! Who doesn’t want to receive an update from loved ones along with a beautiful photo or two showing everyone’s smiling faces. Christmas photo cards help you keep up with everyone you’re blessed to have in your life, including the ones you wish you could see more often. Find your favorite photo(s) from the year and send them with a heartfelt holiday message on stylish Christmas cards from Invitations by Dawn. Did you just get married? 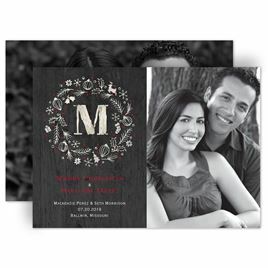 Check out our fantastic selection of holiday cards for newlyweds.